개성의 독립 만세운동이 절정에 다다른 1919년 3월 3일 오후 2시, 감리교 여성 교인들을 이끌고 목놓아 독립을 외친 전도부인 어윤희. 너무도 위험하여 누구도 쉽사리 나서지 않은 독립선언서 배포를 자처한 그녀는 마침내 숨겨둔 선언서를 휘날리며 여성 교인들이 교회 밖, 세상을 향해 신앙을 넓히는 데 앞장섰다. 독립선언서를 직접 배포하며 개성의 만세 시위를 이끈 어윤희는 독립 만세 운동의 중심에 있었다. 전도부인 어윤희는 1880년 충주에서 태어났다. 유학자인 아버지에게 소학을 배우며 성장한 그녀는 ‘ 말은 진실하고 신의가 있어야 하며 행실은 성실하고 신중해야 한다 ‘ 는 소학의 글귀를 일생의 좌우명으로 삼았다. 16세가 되던 해에 결혼을 하였는데 의병운동에 가담한 남편이 결혼 3일 만에 행방불명이 되는 불운을 맞게 된다. 이듬해에는 아버지마저 세상을 떠나 의지할 곳 하나 없는 신세가 되었다. 이후 1909년 개성에 정착한 그녀는, 나라를 구하는 길을 찾아야 한다는 절실함으로 기독교 신앙을 받아들였다. 어윤희는 1909년 6월 13일 남감리회 개성북부교회에서 선교사 갬블(F. K. Gamble) 에게 세례를 받은 후, 교육의 기회를 놓친 과부와 기혼여성들을 교육시킨 미리흠여학교에 입학하였다. 미리흠여학교 재학 중 일제강점을 당하게 되자 어윤희는 ‘국권이 상실된 나라에서 사는 것은 죽음보다 나을 것이 없다’라고 낙담하며 자결을 결심한다. 그러나 기도 중, 죽음으로 고통을 피할 것이 아니라 때를 기다리며 국권을 찾는 일에 힘을 보태야 함을 깨닫고 마음을 다잡았다. 신앙 안에서 국권을 회복하는 일에 힘을 보태는 것, 그것은 무엇보다도 자신을 더욱 개발하는 데서 시작되어야 한다는 그녀의 열정은 이후 호수돈 여학교 입학으로 이어진다. 1915년 3월 호수돈여학교를 졸업할 때 그녀의 나이는 36세, 이후 전도부인이 되어 25년을 교회 사역에 헌신하였다. 1919년, 전도부인 어윤희는 개성을 거점으로 인근 산간벽지의 교회들을 순회하며 여성 교인들을 지도하고 있었다. 당시 3.1운동의 민족대표들은 교회조직과 학교조직을 통해 3.1운동을 지방으로 확산시킬 계획을 하고 있었다. 민족대표 33인 중 한 사람인 오화영 목사는 2월 26일 독립선언서 80여 매를 개성북부교회 강조원 목사에게 전달하였고 지하실에 숨게 두고 배포할 사람을 물색하던 중 어윤희가 자진하며 나섰다. 국권을 되찾는 데 힘을 보태야 한다는 그녀의 민족의식이 죽음을 마다하지 않는 독립운동으로 이어진 순간이다. 독립선언서를 배포하고 개성 만세운동을 주동한 혐의로 어윤희는 경찰에 체포되어 1년 6개월형을 선고 받아 서대문형무소에서 옥고를 치르는 중에도 감방의 동지들과 수차례 옥중 만세 시위를 주도하여 일제의 무도한 탄압과 모진 악형을 견뎌야 했다. 출옥한 이후에는 개성에서 전도부인으로 활동하면서 민족 계몽운동과 여성 교육에 헌신하는 한편, 독립운동 지원도 꾸준히 하였다. 상해 임시정부의 밀사나 독립군의 은신처를 제공하고 애국청년들의 뒷바라지를 아끼지 않던 그녀는 민족운동 단체인 신간회와 근우회 개성지회의 간사, 집행위원 등으로 활발히 활동하였다. 어윤희는 선교사업에도 깊은 관심을 기울였다. 그의 나이 58세에 여선교회의 파송을 받아 황해도 옹진반도 서남쪽에 있는 섬, 어화도에서 선교를 시작하였고 그곳에 부임한 지 1년 만에 교회가 설립되는 결실을 본다. 하지만 일제의 탄압으로 목회는 3년만에 끝을 맺게 되고 개성으로 다시 돌아온 그녀는 유린보육원을 설립하여 고아들을 돌보기 시작하였다. 해방 이후 월남하여 서울 마포에 보육원을 재건하고 복지사업을 20년간 이어간 ‘고아의 할머니’ 어윤희, 82세의 일기로 하나님 품에 안기기까지 교회와 나라와 민족을 위해 죽기까지 충성한 진실한 하나님의 사람이었다. 3.1운동의 제 34인으로 불리는 스코필드 박사(Dr. Frank W. Schofield)가 바친 추모의 글은 어윤희의 사람됨의 넓이와 깊이를 잘 이야기해 준다. 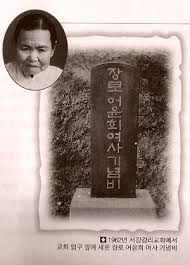 The Bible Woman, Yoonhee Euh, led the march of Methodist church women and cried out for independence on March 3, 1919, at 2 PM, when the Gaeseong Independence Movement reached its peak. She volunteered to distribute declaration of independence flyers when no one would dare out of fear. She also led church women to spread their faith outside of the church. By distributing the declaration of independence flyers and leading the march, she became its central figure. She was born in Chungju in 1880. She was raised by her father who was a Confucian scholar. Her father’s teachings became her life-long motto: “honesty and trustworthiness in words and sincerity and attentiveness in behaviors.” She married at the age of 16. Unfortunately, three days after the marriage, her husband who was in the military service became missing. When her father passed away the year after, her life became unbearably painful with no loved ones nearby. Then, she moved to Gaeseong in 1909 and embraced Christian faith with the hope to reclaim her country. She was baptized by F. K. Gamble, a missionary, at the Gaeseong North Church of the Methodist Episcopal South on June 13, 1909. She attended the Mary Helm School where many widows and married women who missed their educational opportunities were educated. Unfortunately, during her time at the Mary HelmSchool, the country fell into hands of Japanese imperialism. She decided to take her own life out of despondency at one point, thinking that “living in a country where the national power was lost was no better than death.” However, while praying, she realized that she should abide time and help the country to regain the national sovereignty instead of suicide just to avoid suffering. Her passion for restoring national sovereignty in faith led her to think that it should begin with improving herself more than anything. Eventually she enrolled at Holston Girl’s School. She was 36 years old when she graduated from Holston Girl’s School in March, 1915. She devoted herself to her church ministry for 25 more years after that. In 1919, she traveled to different churches in the mountainous areas near Gaesong in order to educate female church members. 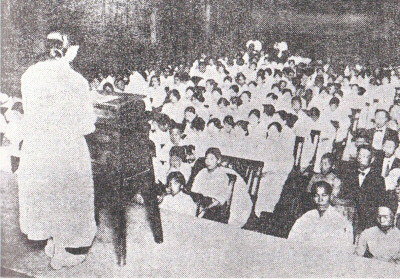 At the time, the national representatives of the 3.1 Movement had plans to spread it to the provinces by organizing churches and schools. On February 26, Rev. Whayoung Oh, one of the 33 national representatives of the independence movement, delivered 80 copies of the Declaration of Independence to Reverend Chowon Kang of the Gaesong North Church. And he was also searching for a person who would distribute more copies that were hidden in the basement. Yoonhee Euh volunteered to do the work. In conclusion, her national consciousness to help the Independence Movement motivated her to bravely face dangerous situations where the possibility of death outweighed the possibility of liberty. Unfortunately, Yoonhee Euh was arrested on the charges of distributing declaration of independence flyers and leading the independence march of Gaeseong. She was sentenced to one year and six months in jail. While serving her sentence in the Westgate prison, she led her inmates to independence march several times. At times, she had to endure harsh punishment by the prison guards. 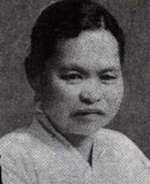 After discharge from the prison, she worked as a Bible Woman in Gaesong and devoted herself to the national enlightenment movement and educating women. She also helped the independence movement continuously. Her tireless work did not simply end there. She served as a facilitator of the Shanghai Provisional Government and a guardian of the independence army by providing hideout. She did not hesitate to support the patriotic youths. She also actively worked as an executive officer for the Shingan Society and Gaeseong branch of the Geunwoo Society. Yoonhee Euh also had a deep passion for missionary work. At the age of 58, she was sent to the island of Euhhwado, southwest of the Ongjin Peninsula in Hwanghae Province as a missionary. With God’s grace, a church was established within one year after her arrival there. Unfortunately, the church had to be closed in three years due to the Japanese imperialism. Knowing that she still had the potential to bear fruits with God’s grace, she returned to Kaesong, established Yurin Orphanage, and began to care for orphans. After the liberation from Japanese occupation, she went to Seoul and rebuilt the orphanage there, and continued the social welfare work for 20 years as ‘the grandmother of orphans’. She was truly a woman of faith who devoted herself to ministries of church and her people until she passed away at the age of 82. The eulogy by Dr. Frank W. Schofield, called as the 34th member of the 3.1 Movement, describes well the extent and depth of her humanness.